An intimate wedding featuring naturals and neutrals. 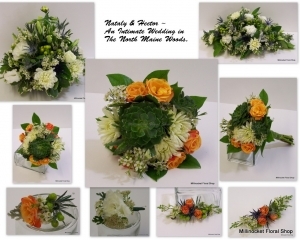 Nosegay of white dahlias, orange spray roses, succulents and waxflower for the bride. As the reception venue featured various style tables, round and long and low designs were utilized. Pricing is for bridal nosegay only.